With mothers day only a few days way (This Sunday here in the UK), its time to get the gifts ready! So if you haven't already sorted out a gift for your mum for sunday this post is for you! I love personalised cards, funky pigeon is my favourite website for this funky pigeon they have a great range of cards available starting from £1.79, their range is available here! My favourite gift idea is always experience days. For mothers day i think a spa day for 2 is the perfect gift because you get to spend time with your parent and its a great day out! My favourite spa day deal is available from Virgin Experience Days and is a Spa Retreat & Afternoon Tea, this deal is 50% at the moment at £39. This deal is available here. Another great gift idea if you have forgotten its Mother Day, (Hint hint boyfriend) is flowers, you can't go wrong with flowers! Interflora has a whole range of Mothers Day flower ideas. My favourite is the Mothers Day Perfect Gift, costing from £29.99 with a vase included. This gift is available here. Interflora also offers next day delivery which is excellent if you have left it until the last minute! If your mother is a charm bracelet kind of lady, my favourite jewellery item for this mothers day is the Pandora Mother & Daughter Pendant Charm. (Also available for Mother & Son). The charms thereself are two hearts each saying Mother and Daughter and then they are together they make a whole which i think is really cute! This gift idea costs £65 and is available in stores and on the Pandora website. My final gift idea is a Emma Bridgewater Mug from the mothers day collection. My mum loves mugs so this is a perfect gift idea for her. This mug retails at £19.95 and is available on the Emma Bridgewater website. 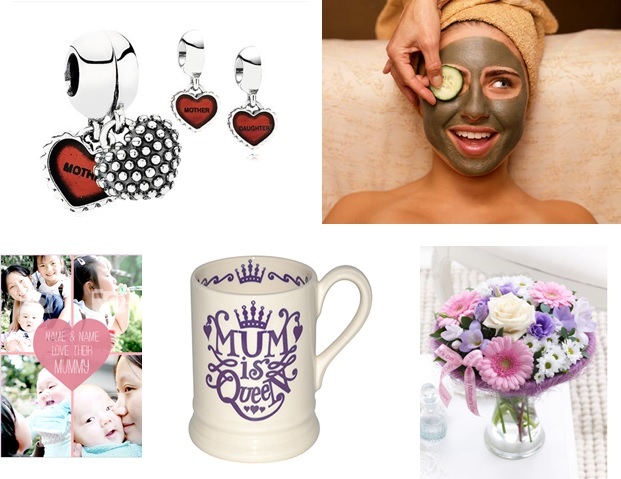 What are you getting your mum for mothers day this year?